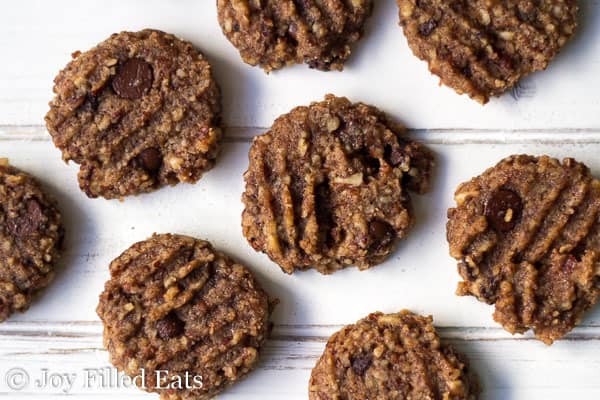 These super simple Pecan Cookies are bursting with flavor. 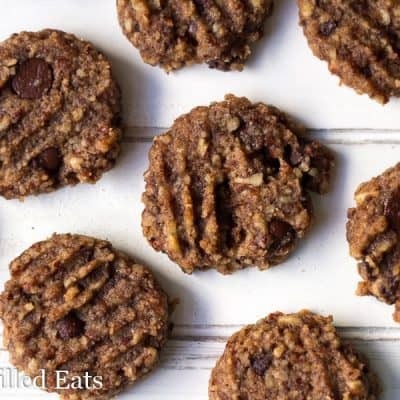 They are full of chocolate chips, chopped pecans, and cinnamon. With only 8 ingredients, a bowl, and a wooden spoon they mix up in 5 minutes. I love super simple recipes that highlight a few delicious ingredients. And these cookies fit the list. You can taste the pecans, a hint of cinnamon, and the richness of the chocolate. 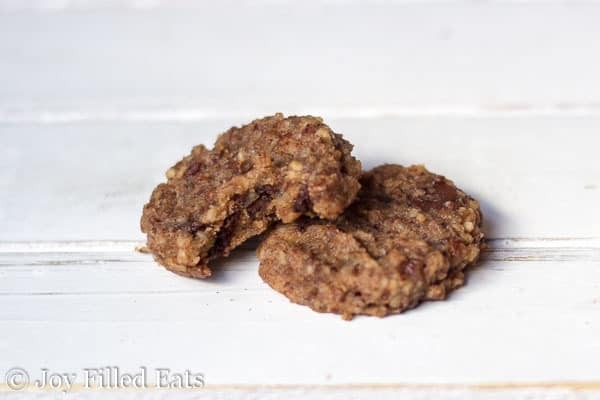 You’ll probably be seeing a few more pecan recipes coming up this fall! There two reasons for that. The first is my sweet five year old had an allergic reaction to pistachios in the beginning of the summer. Her lips swelled up like balloons and we went to the ER to make sure the reaction didn’t continue. After that our family doctor did some allergy testing. She is very allergic to pistachios and cashews. She’s eaten peanuts and almonds with no reaction but we decided to just eliminate all tree nuts and peanuts from her diet to be safe. The nut lowest on the list of potential allergens was pecans. The second reason is that pecans are actually my favorite nut. I’m grateful she was fine (and we now have a epipen just in case) and I’m grateful I can still use some nuts. No more cashews or pistachios in the house but the rest are fine to have around and use in my recipes. 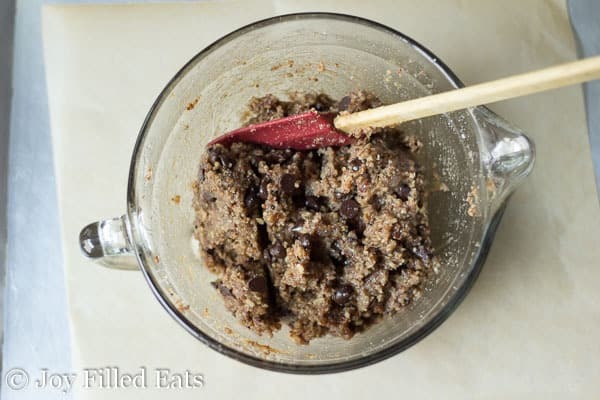 Mix all ingredients in a medium bowl with a wooden spoon until well combined. 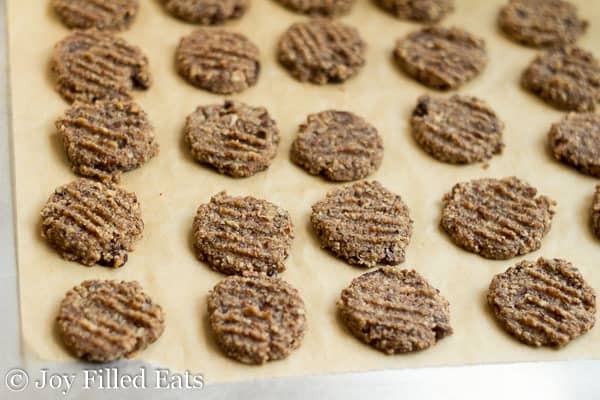 Use a small cookie scoop to make 30 cookies. Flatten with a fork. Dip the fork into a glass of water in between cookies so they don’t stick to it. Bake for 14-16 minutes until golden and slightly firm to the touch. Use a small cookie scoop to make 30 cookies. Flatten with a fork. Dip the fork into a glass of water in between cookies so they don't stick to it. Are these soft or crunchy cookies? I Don't use the sweeteners in that blend. Can I just use the same amount of coconut sugar? Not sure if that blend is a cup for cup equivalent. You will need more coconut sugar. Try 1.5 times the amount and taste test as you add it. Your comment mentioned coconut flour, but I don't see that in the ingredient list. I was going to make these today. The recipe is correct. My comment was wrong. I thought I was commenting on my butter pecan cookie instead. I just edited it. Can you use THM baking blend? It may sub in for the almond flour but the texture would change. If you try it use a little less.